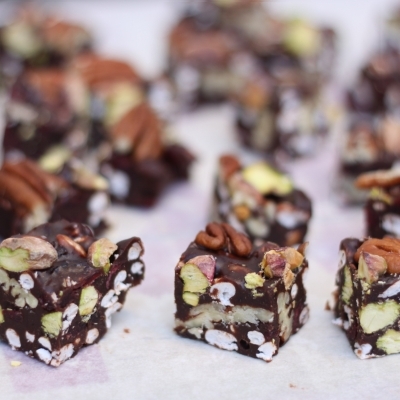 Rocky road, dairy free and without refined sugar. 1. In a saucepan melt the coconut oil. 2. Add the agave syrup & almond butter and stir, pull the pan from the hot plate. 3. Add the dates and cocoa and mix with a hand blender to a smooth paste. 4. Add the half of the pistachios, half of the pecans, puffed rice & dried cranberries and stir. 5. Place the baking sheet in a mold / tin (I used 2-liter glass jar) and pour the mixture into the mold. 6. Garnish with the rest of the pistachios & pecans and a pinch of salt flakes. 7. Set in the fridge for a while until it solidifies. Share to pieces and enjoy!